Whether a drug is used to combat cancer, fight infectious diseases or protect maternal health, a medicine must be of good quality in order for a patient to receive an effective therapeutic benefit. The toll that poor-quality medicines take on global public health-particularly among the most vulnerable populations in the developing world-is staggering, with 99% of all maternal deaths occurring in developing countries. While expectant mothers and their babies in these nations may already be struggling due to limited healthcare resources, counterfeit and substandard medicines can often exacerbate an already grim situation. Earlier this month, a partnership involving Boston University (BU), USP and the U.S. Agency for International Development (USAID) received major support to further develop a cutting-edge device called PharmaChk. This innovative device has the potential to revolutionize the detection of poor-quality medicines throughout the world. A $2 million transition-to-scale grant from Saving Lives at Birth: A Grand Challenge for Development will bring BU and its partners one step closer to a potentially commercializable device. 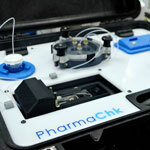 Portable and easy-to-use, PharmaChk is being developed to detect and quantify active ingredients in medicines without the need for users to be trained on complicated analytical techniques and instruments. This can be a tremendous benefit to hospital personnel caring for patients who’ve purchased medicines from different (and perhaps in some cases, questionable) sources as well as regulators and others tasked with tracking the quality of their medicine supplies. This would hold especially true in Sub-Saharan Africa and Asia where national borders are often porous and tracking the flow of medicines from country to country can be extremely challenging. Having the appropriate amount and quality of an active pharmaceutical ingredient is key for any medicine to be effective. A poor-quality medicine can be one without enough active ingredient, which can lead to drug resistance in patients being treated. In other cases, a medicine may have the correct amount of active ingredient but may be of poor quality due to poor manufacturing practices, which can compromise the medicine’s ability to bring a clinical benefit to the patient. PharmaChk-which was named as one of Scientific American magazine’s “World Changing Ideas of 2013”- has been in development by scientists from the Protecting the Quality of Medicines (PQM) program and BU. Building country capacity to address public health concerns posed by counterfeit and substandard-quality medicines has been a long-standing goal of PQM, a 10-year program managed by the USAID Office of Health Systems (OHS) of the Bureau for Global Health, with the aim of strengthening country health systems and improving health outcomes. A scientific organization dedicated to creating quality standards for medicines, food ingredients and dietary supplements, USP works collaboratively with USAID to implement PQM. Launched in 2011, the Saving Lives at Birth partnership includes USAID, the Government of Norway, the Bill & Melinda Gates Foundation, Grand Challenges Canada (funded by the Government of Canada), and the U.K’s Department for International Development . Saving Lives at Birth is a global call for groundbreaking, scalable solutions to prevent infant and maternal deaths around the time of birth and supports a wide variety of work across maternal and neonatal health, family planning, nutrition and HIV. While other methods to screen for substandard or counterfeit products in the field are currently available, they are limited in their ability to quickly quantify the actual amount of active ingredient in a sample as well as to determine how quickly that active ingredient dissolves so it can work in the body as intended. This past spring, the first pilot study using PharmaChk on medicine samples was conducted at USP’s Center for Pharmaceutical Advancement and Training in Accra, Ghana. USP opened CePAT in May 2013 to help expand the number of trained experts and available tools to combat substandard and counterfeit medicines that threaten nations in Sub-Saharan Africa. The pilot study was conducted of samples of the antimalarial medicine, artesunate, collected from three main medicine sources in Accra-public hospital/clinics, private retail/wholesale pharmacies and informal outlets. USP and BU scientists are excited about early results from the pilot study, and plans are underway to test PharmaChk on samples of other medicines collected from the field. Learn more about USP’s role in the fight against poor-quality medicines in the developing world by visiting usp.org/pqm. Kennedy Chibwe, Ph.D., is senior manager of the Promoting the Quality of Medicines Program.